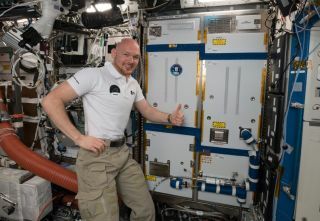 ESA astronaut Alexander Gerst poses on Oct. 19, 2018, with the ACLS life-support rack, newly installed on the International Space Station. A new life-support system that can recycle breathable air is being installed at the International Space Station, promising to dramatically decrease the amount of water that needs to be brought to the orbital outpost to make oxygen. The system represents an important step toward so-called closed-loop life-support systems that could one day sustain space crews indefinitely without supply missions from Earth. Such systems will be crucial for future long-duration missions to the moon and Mars. The 750-kilogram (1,650 lbs.) system, housed in a payload rack 2 meters by 1 m by 90 centimeters in size (6.5 by 3.3 by 3 feet), recycles 50 percent of the carbon dioxide (CO2) exhaled by the astronauts back into oxygen. As the air passes through the system, the CO2 is trapped in small beads made of amine, an organic compound similar to ammonia. "Once we remove CO2 from the cabin air, we extract it from these materials and we get almost pure CO2," Daniele Laurini, who led the ESA team that developed the system, told Space.com. "Then, we react the CO2 with hydrogen and we extract water and methane." Water is further split into hydrogen and — more importantly — oxygen, which the astronauts can breathe. In the past, all water for making oxygen would have to be brought from Earth. The new process extracts an equal amount of water and methane, Laurini said. But there is currently no use for the methane, which is produced in the form of carbon dust. "Processing pure methane in orbit and getting something useable out of it is quite challenging," said Laurini. "Dust in microgravity is messy. So, we just vent the methane to space." Laurini said that his team doesn't plan to increase the efficiency of the system to recycle more than the current 50 percent of the exhaled CO2. However, next year, the team will test the system in conjunction with an algae photo-bioreactor developed by the German aerospace agency, DLR. "The extracted CO2 will be then fed to the algae. The algae will grow with the CO2 and through photosynthesis release oxygen," said Laurini. "In the more distant future, we would have algae directly picking up the CO2 from the cabin atmosphere." ACLS will be installed inside the US Destiny module in November and will provide half of the oxygen needed for three astronauts, ESA officials said in a statement. (A fully-staffed space station has six crewmembers, and as many as nine can live there.) The agency plans to test the system for one or two years. The station already uses a system that recycles urine back into drinkable water. A system similar to ACLS might be used in the future to help regenerate breathable air inside the Lunar Gateway. That proposed moon-orbiting station is currently being considered by the world's space agencies. Laurini, however, said that having a system such as the ACLS aboard any spacecraft would make sense only for longer-duration missions. "There is a trade-off between launch mass and the number of days you spend in the place," he said. Traveling on Earth, "if you go only for a couple of weeks, you don't need to bring with you a washing machine. [Similarly, in space] it would only make sense if you are going for longer-duration missions — 90, 120 days — then the trade-off between recovery and an open-loop system becomes convenient." For a future mission to Mars, which could take years to complete, a closed-loop system would be a necessity; resupply missions would not be possible, and carrying resources that would last for the entire mission would be too costly, according to experts. ESA is already working on a closed-loop system called Melissa that would recycle all the resources the crew would need to survive on Mars: food, water and oxygen. This system would take exhaled air, human waste and wastewater and use bacteria, algae and higher plants create drinkable water and breathable oxygen. The system would also grow plants for the astronauts to eat.